I recently lost a bet with someone. He chose to take his winnings in chocolate chip cookies (CCCs). Well, I rendered him his due. And he was happy. But I was appalled. With 2 sticks of butter and a cup-and-a-half of sugar in this recipe, no one could ever say these cookies do a heart good. And this guy has the sort of heart you want to see beating for a long time. 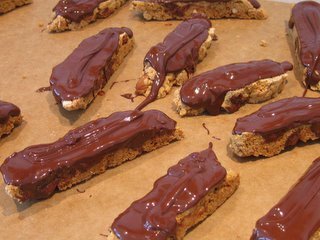 So yesterday, on a whim, I spread some melted dark chocolate over a batch of almond biscotti I'd just made and urged him to try one. He suggests I use them as my ante for our next bet. I'm glad these have the power to entice him away from CCCs. A biscotti's profile is more conducive to a beating heart. Below are the ingredients I used for my analysis, and a comparison of a few nutrients. * This is my own recipe. I developed it to be lower in fat than more traditional biscotti recipes. Although I'd still wager that spreading melted chocolate over any biscotti would create a lower-fat chocolate chip cookie alternative. Care must be taken not to completely coat the biscotti with chocolate. The risk is explained in The Cause of Explosion in Chocolate Candies by John Weinzirl, Journal of Bacteriology, 1922. Here's a nutritional comparison. I slated 2 chocolate chip cookies against one biscotti, since those serving sizes were closest in weight and volume.